Cooler fall temperatures are great for growing vegetables like broccoli, kale and carrots, but they are also a signal that the time to put our garden to bed is fast approaching. Not too long ago, it was believed that the best practice was to tidy everything up – clearing away all remaining debris and making our garden areas as neat as possible before the snow began to fly. That’s no longer the case. So, what should we be doing? 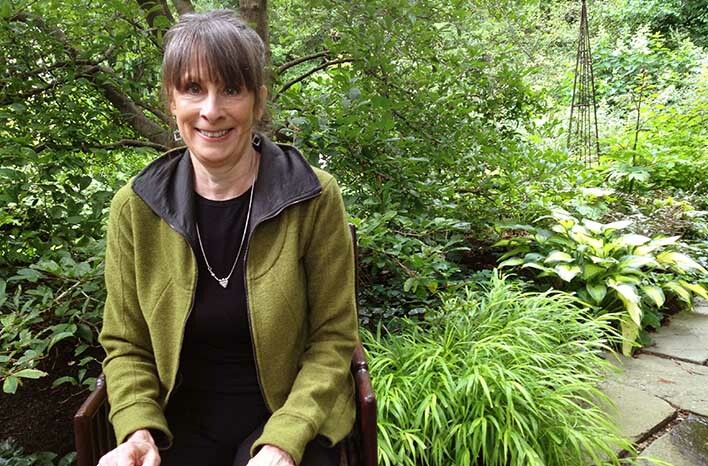 I asked my friend and expert gardener, Margaret Roach of A Way to Garden to join me for this discussion and share her end-of-season preparation steps. 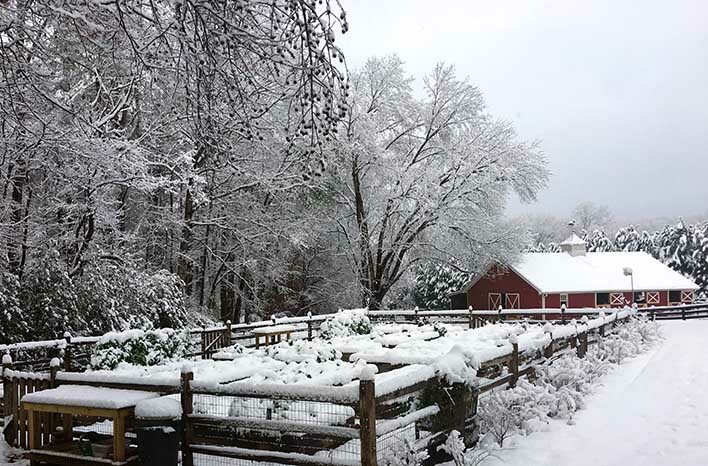 Margaret has been gardening for more than thirty years on over two acres of hilly property in upstate New York, so she knows a thing or two about winter preparation. 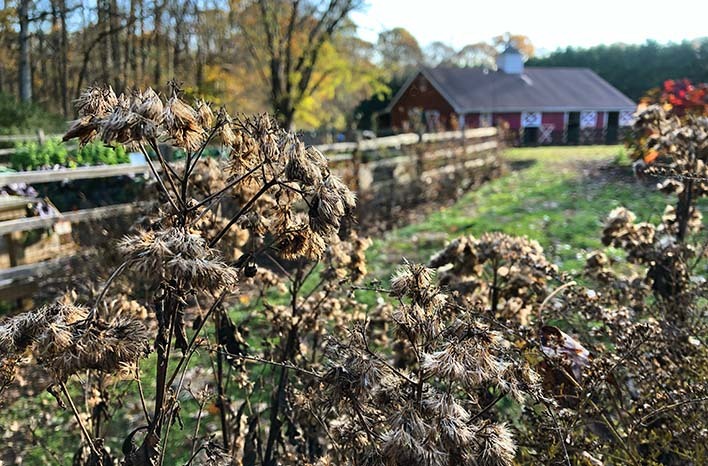 Margaret Roach has been gardening at her home in upstate New York for over 30 years – and handles most of the responsibilities of these 2.3 acres on her own. Although she manages her land and its many garden spaces on her own – while also juggling duties of her popular podcast, speaking engagements and writing – she does receive a few hours of help once or twice each week throughout the season. With so much to do before winter rolls in, she admits to calling in a few more troops to assist this time of year. Until recently, Margaret stuck to a fairly regular schedule as to when she began winter prep, but like the rest of us, the past several years have brought some wild weather shifts. So these days, she feels that it’s never too soon to get started. Unexpected cold snaps can catch the best of us off our guard, so it’s better to try to be ahead of the curve rather than behind it. For many of us, one of the biggest pre-winter tasks is managing the leaves which have fallen on our property. Margaret deals with hers in two stages. She has observed that the maple trees on and around her property will drop their leaves first, while the leaves from her oak trees fall much later. It takes more time for her to do the work twice, but if she waits to take action until all the leaves are down, she may not have the opportunity to get to them at all before they are blanketed in snow. Margaret used to rake up all the leaves of her property, but lately, she’s come to realize the important ecological value those leaves provide when left in place. That said, it’s not practical for Margaret – or for many of us – to let all the leaves remain where they’ve fallen. What we can do is choose to be strategic and thoughtful with our late season cleanup. Leaf litter is vital to the beneficial creatures of your landscape. Many insects require it as a habitat to survive the coldest months of the year. Some lay their eggs on the underside of leaves to lay dormant until warm spring temperatures signal it’s time to hatch. Margaret likes to say that there is a constant tension between what nature requires of our garden spaces and what is realistic for our needs. Before the leaves even begin to fall, she has selectively planned out which areas she will rake and those she will keep in their natural state as a compromise for the benefit of her ecosystem. Areas around plants which have shown signs of disease or pest infestation will be thoroughly cleaned. She removes the debris and gets it off of her property to avoid future spread of the issue. Margaret also makes sure to clear out areas where small and delicate bulbs would struggle to push up through a heavy layer of decomposing leaves in spring. Walkways and other areas she will need to keep clear of snow are also raked clean for the sake of practicality. Margaret adds all her collected leaves to the compost pile. Up to 80% of the nutrients that trees take up from the soil through the season is stored in leaves, so why not put those valuable nutrients back to work in the garden? Shredded leaves are my favorite mulch material, and I can never get enough. I don’t just gather leaves from my own property at the GardenFarm™. 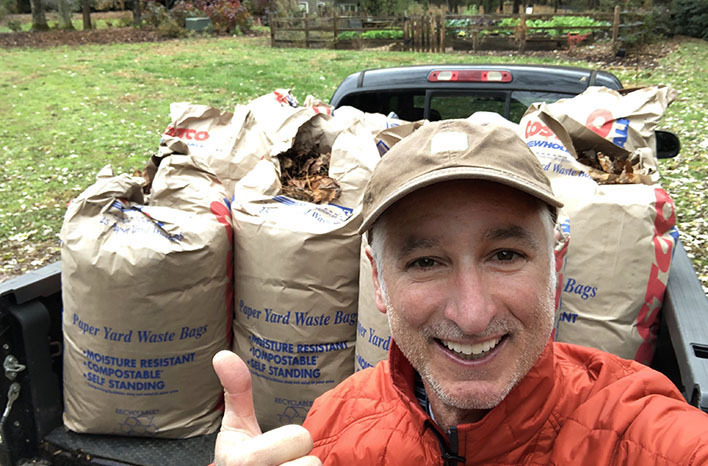 I go online and offer to pick up bagged leaves from homeowners in my community. I also talk to local landscaping companies and offer to take their leaves. I spread them in my garden and landscape beds to reduce weeds, protect the soil surface, reduce watering, and provide so many other benefits. Adding mulch is one of the best things you can do for a healthier garden – and shredded leaves are one of the best types of mulch around. Over time, the leaves will break down and return all their nutrient stores back into the soil. Trust me – leaves are garden gold. It’s so much better to use them than to add them to our landfills. I’ve had a terrific response to my local social media post offering to pick up bagged leaves. This year, my goal is to use shredded leaves to mulch 100% of my garden and landscape beds at the GardenFarm. When leaves are used as mulch, they still provide habitat space many creatures need to overwinter, but since the leaves have been moved, any insect eggs deposited on them will have also been moved – away from the host tree which is an important food source for their early life cycle. For that reason, it’s best to allow some leaves to remain under the tree from which they’ve fallen. Around the perimeter of her property and in larger landscape beds, Margaret intentionally opts not to rake at all. This keeps insect eggs near their food source and serves to increase the population of many beneficial bugs. Some insects – like caterpillars – will hatch and move into the host tree in spring and serve as a critical food source for birds to feed their chicks. Once temperatures reach about 50 degrees in spring, it’s a good idea to allow about a week for all these creatures to hatch and emerge from their winter slumber. They will move on to their spring environments to feed and begin their cycle again. 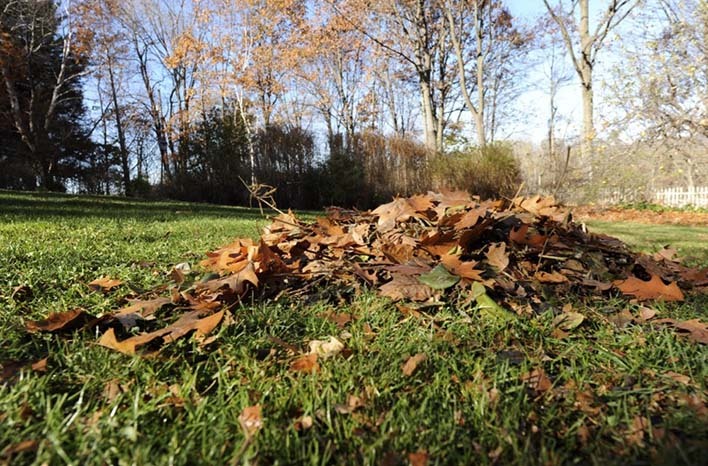 Then, you can choose to gather leaves up to add to your compost pile or garden beds – or let them decompose in place. There’s a natural cycle at work all around us – a much bigger picture to keep in mind. When we make room for compromise to meet the needs of all the creatures in our environment, our garden ecosystems will reap greater rewards year after year. This same principle holds true for other garden debris. Messy can be something to celebrate in the garden. That’s good news for our busy lives! Let perennial seed heads remain in place. Don’t cut back all of the dead foliage from your ornamental plantings or spent vegetables. There are many beneficial insects which require these areas to survive winter as well, and the seeds are a valuable food source for birds. Margaret and I have both learned to allow seed heads to remain in place on spent perennials as a food source for birds. Margaret keeps her seed pods on the plants until the first or second heavy snow knocks them down. Once they’ve been crushed by Old Man Winter, she will often cut them off and add them to her compost pile. Ultimately though, she lets the birds on her property be her guide. She has found that by observing their behavior, she will recognize when they have finished with the pods and seed heads for the season. Weeds are a different story. Margaret lives by the credo “One year, seeds. Seven years, weeds.” She is keenly aware that allowing weeds to remain at any time of year will only result in more weed problems down the road, so she doesn’t give up on pulling weeds until the ground is frozen. 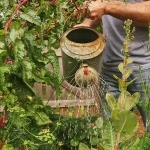 Right up until the snow flies, an organic gardener’s best line of defense against weeds is ongoing proactive management. Margaret keeps a large number of tropical plants in containers around her landscape. It’s a big, but necessary, job to move them to shelter for the winter. Although some plastic or fiberglass containers can survive cold temperatures, most expensive pots will crack, and even weatherproof pots can be damaged during harsh winter storms. So although her containerized conifers could withstand the outdoors, she shelters them through winter to protect the pots. She’s also incorporated some plants into her landscape beds which aren’t hardy in her 5b zone. All of those tender plants must be brought indoors through the cold months, or they would need to be replaced in spring. Winter storage environments are unique to each of our homes – with varying light, temperature and humidity. If you have plants you will be sheltering, learn a little about their needs, so you can understand how best to accommodate them in the space you have available. 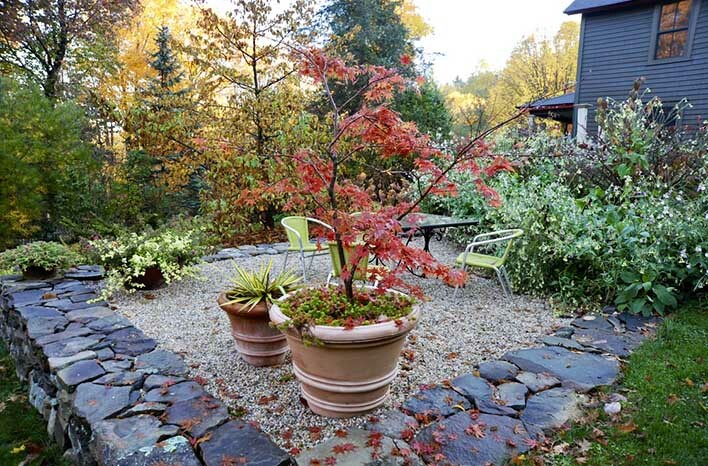 Plant species which defoliate, like Japanese maples and figs, go into complete dormancy and won’t require any light or much, if any, water through the coldest months. What they do need is protection from wind and ice. They can be stored in any cool, dark and dry location to protect their tender branches. Evergreens can take winter cold, but their enduring foliage requires light. Margaret stores hers near the windows of her unheated garage and periodically checks the soil for dryness. She sticks her finger into the soil surface and, if it feels dry, provides a little water. During times when the container soil freezes, it won’t take up water, but Margaret keeps an eye on them for changing conditions. As the plants begin to respond to the triggers of approaching spring, their needs will increase. Since she has so many containers to overwinter, Margaret makes preparations about a month before she expects conditions will require that the plants be brought inside. She moves all the containers into a group near her barn. That way, she won’t be caught off guard by an early storm. When the weather turns, she can move those containers to their winter storage quickly. For the canna and calla lilies, dahlias and other non-hardy species planted in her landscape beds; Margaret waits to take action until the foliage has been killed by frost, which signals the plants to go into dormancy. After the frost, she cuts the stalks back to a height of 6-12” and, then, carefully loosens the soil around the perimeter of the roots using a garden fork. It’s important to avoid damaging the roots or bulbs. If they are pierced by the fork or by a shovel, they will rot. 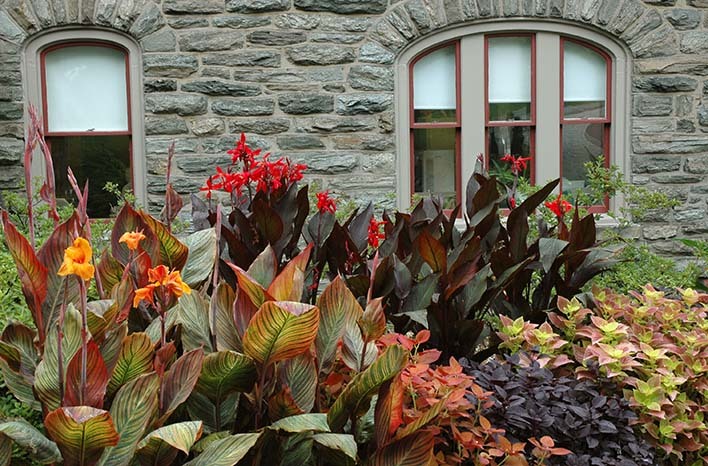 Canna lilies are a showstopper in the garden, and they are easy to dig up and overwinter indoors in cooler zones. Once the soil is broken up, she can gently pull the plants from the ground and leave them outside to dry for a few days. Storing these plants is the easy part. After knocking off most of any remaining dirt from the roots, Margaret piles the plants in plastic nursery pots in her dry, dark basement and ignores them until it’s time to replant in spring. 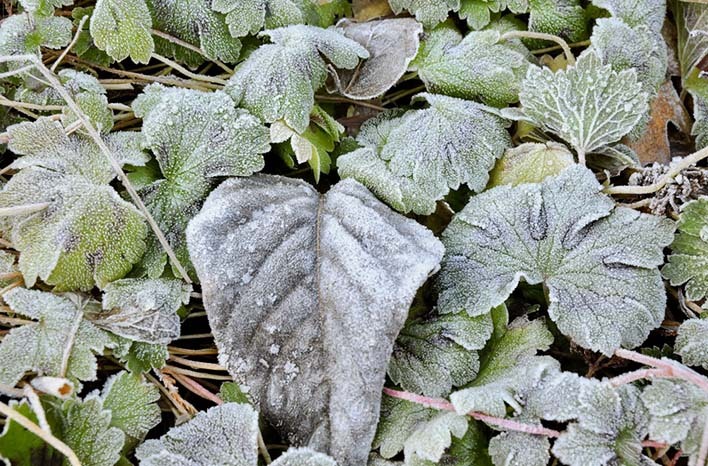 For some plants, it can be better to force them into dormancy for winter rather than bringing them into the less-than-ideal conditions of a heated home. For example, Margaret found that her banana plant suffered more and took longer to bounces back in spring after spending the winter in her warm, dry home environment. Instead, she forces it into dormancy and lays it on the floor of her dark basement as temperatures begin to drop. Sometimes, the only way to learn that lesson is to lose a tender plant or two. For Margaret, her struggle was with elephant ear plants. Some varieties have a large bulb, which stores water and energy resources. She had success forcing those into dormancy by storing them in her basement without light or water. It was the elephant ear varieties grown from tubers which caused her heartache. After killing a few of those, she realized that they would only survive in cool, bright spots with some watering throughout the cold months. As gardeners, we are constantly learning from our own experiences, and tropical plants are certainly no exception. 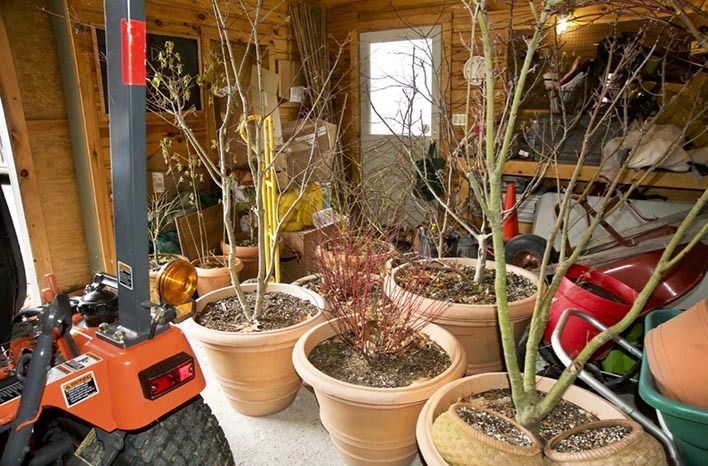 One good guideline for storing tender plants is temperature – 40-50 degrees is a common sweet spot for overwintering. The bottom line is that you may need to experiment with storage options to learn what your plants want to do and how best to accommodate that. Ever the all-season plant dynamo, Margaret also has a number of houseplants that she likes to keep outdoors throughout the growing season. Those, too, must be relocated indoors for winter, but there are important steps to take to prevent transition shock. Once the weather turns cool outside, temperatures indoors are probably warmer thanks to your central heating system – but that also dries out the air. Houseplants will be healthier when they are given a little time to acclimate. In September, Margaret begins to stage her houseplants on a covered porch or in a well-lit shed, so they can re-acquaint themselves with drier indoor air and moderate temperatures. Those plants will require less water through the darker months of winter, so keeping them out of fall rains prevents them from getting too soggy. After a week or two, Margaret eases them back into their final off-season location in her home. Indoor plants can benefit from artificial lighting, but Margaret chooses to pass on that option. After a busy spring, summer and fall on her large property – not to mention all that container shuffling – she enjoys the downtime that winter provides. Odds are pretty good that you, like me, can relate to that. What do you like to do during your winter downtime? Margaret has made good use of some of hers – while also squeezing in moments during the growing season – to write a new book. I was privileged to get a preview, and I have to tell you, it is a must read. She is celebrating the 21st anniversary of her first book, A Way to Garden, with a fresh update by the same name. Broken into seasons, this new book offers new information and is a feast for the eyes too – with beautiful photographs that I haven’t been able to get enough of since Margaret was kind enough to share them with me. The new publication will be released this spring, and I strongly recommend that you don’t hesitate to pick up your copy. It will become a treasured title in your garden library. If you haven’t already listened in to my conversation with Margaret, you can scroll to the top of the page and click the Play icon in the green bar under the page title. Our chats are always fun, and listening to Margaret’s garden stories is an inspiration. You’ll also hear her describe how she moves all those containerized plants back out into the garden in spring. Whew! Watch for a future podcast where we dive more deeply into waking up the garden. 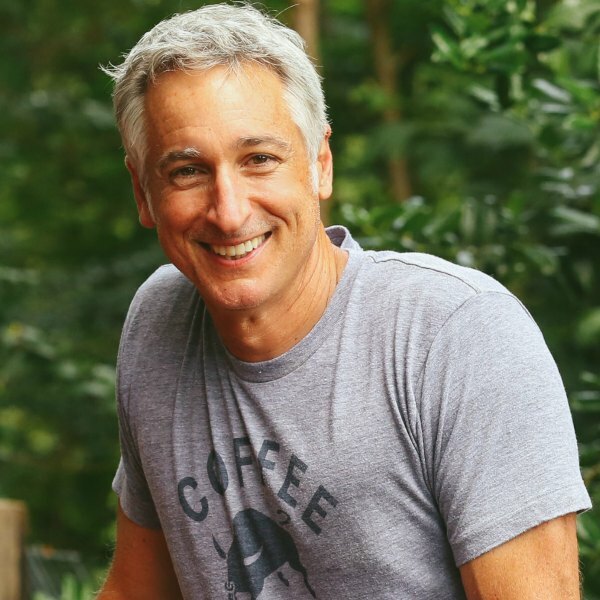 The beginning and the end of the growing season can certainly be the most overwhelming moments for a gardener, but a little planning and a thoughtful approach will always pay dividends with a more bountiful garden next year.